Reasonably priced PC-only software for custom music bed creation. Cinescore may be of particular interest to project and personal-production studio owners looking to offer an alternative for canned library music to their clients. Royalty-free cues of custom lengths, themes, moods and arrangements can be easily auditioned and produced for a variety of uses including corporate and industrial projects, advertisements, books on tape, PSAs and, of course, soundtracks. 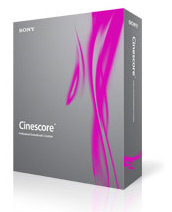 Sony’s list price for Cinescore is a very reasonable $200, though it can be found at several major retailers at the extremely reasonable price of $150. Cinescore generates custom music cues through the choice of an overall Theme and its many associated Variations. The program comes with 20 Theme sets; each Theme comes with around 20 Variations. Cues can be further customized via a series of options and timeline “hints” that affect tempo and the development of dynamics, structure and arrangement over time. The stated system requirements for this PC-only application are relatively modest – Windows 2000 or XP, a 1.5 GHz processor and 512 MB of RAM (see website for complete listing) – but I imagine anyone who is working with audio and/or video professionally already has a system that runs rings around these requirements. The main window of Cinescore most closely resembles Sony’s Vegas video/audio editing software: a horizontal timeline-style area for the display of the video and audio tracks across the top half of the window, and a multi-purpose window-docking area across the bottom half that can be used to display various windows including a file explorer, project media explorer, audio meters and video preview. Like other Sony Media applications, section divisions can be resized and windows can be shuffled, layered in tabs or undocked and placed elsewhere on the desktop. The program limits the number of tracks to one video track and an associated audio track for extracted synchronous audio, a dedicated audio track for the Cinescore-generated music, and an “Audio Transitions” track that can be used for hits, sweeps, swells, sound effects or anything else that strikes your fancy. Cinescore can import a fairly wide variety of media formats including AVI, AIF, BMP, JPG, MP3, MPEG-1 and MPEG-2 video, PCA, PSD, QT, SWF, WAV, WMA and WMV, as well as still image sequences. Finished projects can be rendered out as AVI, AIF, AVC, AAC, MP3, MPEG-1 & MPEG-2 video, Real Audio & Video, WAV and Windows Media Audio & Video. A user with any Sony Vegas experience can be up and generating music in a matter of minutes. The interface is straightforward enough that I can’t imagine anyone with half a head for production, even without that Vegas familiarity, getting bogged down for long. Sony has struck a smart balance between entry-level friendliness and creative control of generated music. Music cues are generated via a dedicated dialog window that, unfortunately, takes the user away from the timeline (and sync video playback). The generator dialog presents hierarchal levels of choices that ultimately cause a specified length of generated music to be rendered and placed on the Cinescore timeline. The user first chooses an overall Theme; the 20 included Themes encompass a decent range — from classical to techno. Specialty Theme Packs (such as the lush and varied “Incredible Vistas”) can be purchased from Sony. The Themes and Variations that came with the program provide some very good musical material with which to work. Despite the fact that the program works by putting together audio samples and loops, most of these are recordings based on MIDI instruments, some of which sound quite flat and artificial. I was hoping that Sony (and its contracted composers) would have made better use of Sony’s amazing and vast collection of actual-instrument samples and loops. A decent analogy for the Cinescore hierarchal order is to consider a Theme as a double-disc concept album by a specific artist. In this analogy, Variations are the equivalent to the 20 or so related songs spanning the album. Each of these songs (Variations) has numerous parts (choruses, bridges, verses) and arrangement changes (breakdowns, dynamics, restatements). Cinescore asks the user to choose a Theme and Variation and then provides a number of choices to tailor the part order, volume and dynamics, and instrumental arrangement. The program employs timeline Hints, the most powerful tool provided for affecting the development of the generated music. Hints can be added anywhere along the mini-timeline in the generator dialog, and can affect change in mood, stylistic deviation, song structure randomness, adjacent section variance, tempo, dynamic intensity and more. Cinescore has been unfairly criticized because Hint changes sometimes don’t take place immediately, but instead happen at the next musically appropriate opportunity. If the program changed to a different section irrespective of meter and other musical factors, users would end up with jarring and unusable cues (much like what I get from video editors when they try to edit music, barking “Just fix it!”). Tools such as tempo changes, transitions, dynamic changes, sound effects and good old two-track editing can easily create proper changes. Ultimately I found a better way (for me) to work: once I’d settled on a Variation and tempo for a section, I rendered out many different versions (created using the various arrangement and dynamic options provided) and cut, pasted and crossfaded the various elements I needed. A nice feature is that any audio event on the timeline can be instantly opened in your favorite editing software, edited and/or processed and saved automatically back to the timeline. This is a useful workaround for the fact that plug-ins are not supported in Cinescore. Also conspicuously missing for pro use is time-stamped broadcast WAV file support (or any timecode sync for that matter) and ReWire support. Coming to the rescue is the included Cinescore Plug-In for Vegas. As a plug-in, Cinescore’s generator interface can opened by right-clicking on a Vegas audio track and generated music inserted directly to the Vegas timeline. This allows the music-generating capabilities of Cinescore to be used in conjunction with all the audio and video capabilities of Vegas, erasing most of the aforementioned limitations and providing access to audio plug-ins, unlimited tracks, surround mixing, ReWire support, timecode support, HD support and everything else that is available in Vegas! Striking a balance between ease-of-use and complex musical control, Sony’s Cinescore successfully provides users with the ability to produce custom music beds with a minimum investment in time, effort and money. Experienced musicians and engineers will hit the program’s limits fairly quickly, but providing Cinescore as a plug-in for Vegas expands its professional-level usefulness immensely.